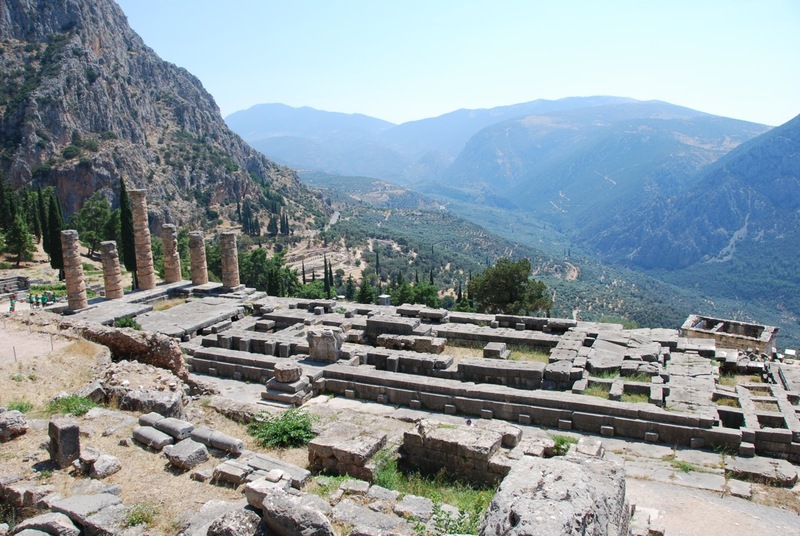 Hawaii, Disneyland, and now Delphi. Boy do I ever have the winter blues! 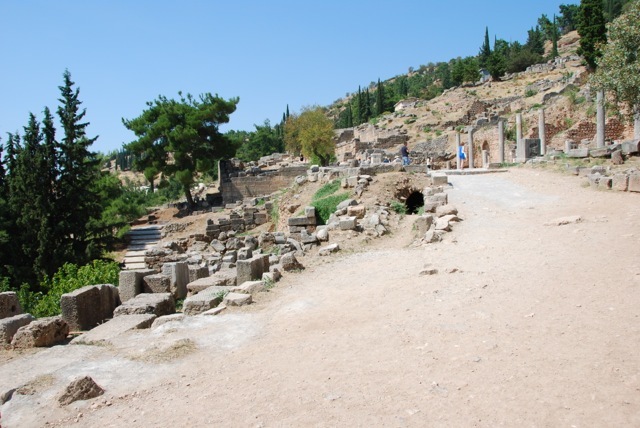 My daughter just finished reading Oedipus the King for her humanities class, and as we were discussing it, I couldn’t help but remember my trip to Delphi last summer. 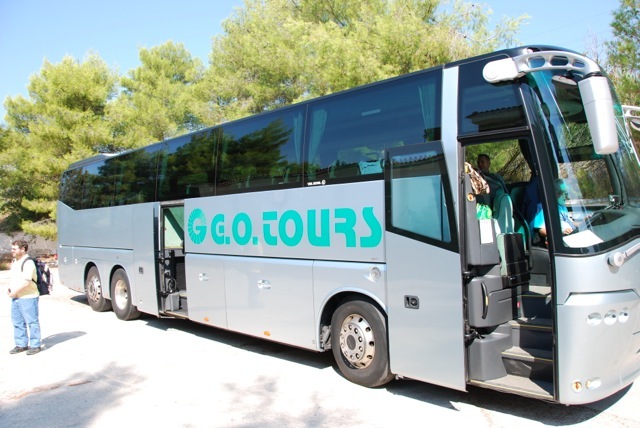 It was on the way to Delphi in a chartered bus that I had the great pleasure of hearing the story of Oedipus told to us by our colleague who is a specialist in all things Greek, with excited interjections from our lovely tour guide. 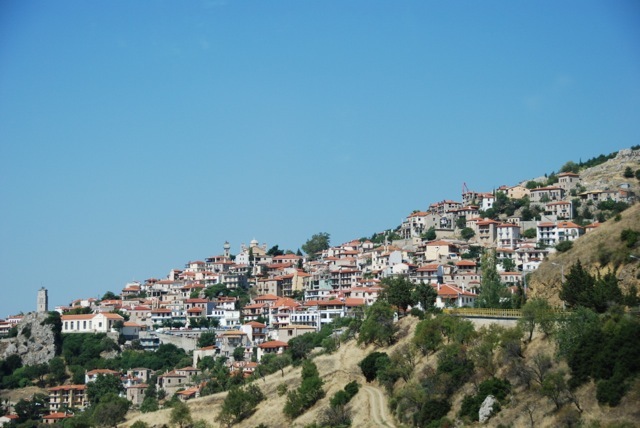 For it is on the way to Delphi where the infamous “three roads meet.” It is purportedly an exact location! We heard the story and craned our necks to see the three roads. Our poor bus driver had probably never taken such a group of nerds and had probably never had the request to stop the bus at the “three roads.” Unfortunately, given the fact that we were in a very large bus on a tiny, curvy mountainside with no shoulder to speak of, the best he could do was slow down a bit so we could take a lame picture through the bus window. Needless to say, they didn’t turn out that great. 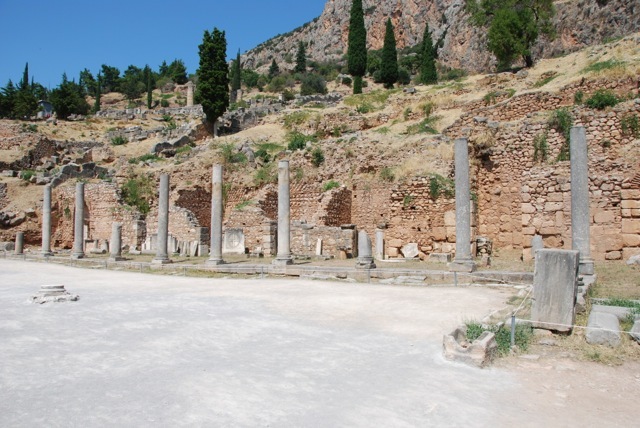 But our trip to Delphi was delightful. Despite the fact that is was nearly 100 degrees. Crazy me, but to my frozen self, that sounds pretty nice right now. There is something truly marvelous about Greece. There is a sense of the ancient there. As a traveler, it is so humbling to see the remnants of such inspired civilizations, and realize that this is where it all started. Greece is where our ideals were born about music, art, architecture, mathematics, poetry, theater, design, philosophy, and politics. 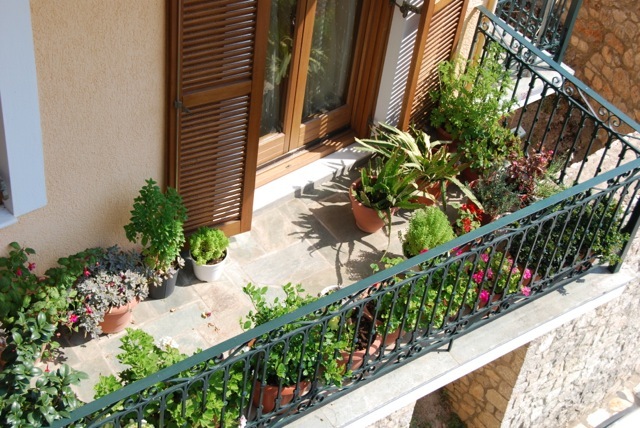 Every day, in nearly every place I can think of, there is some influence from the Greeks. To top off the awe-inspiring sites, the local people we came into contact with were all friendly and smiling, with beautiful Mediterranean skin. Speaking of Mediterranean, I couldn’t help but think of my native California as we traveled through the Greek countryside. The rolling hills, the lush greenery, the farmland, and squat trees reminded me so much of where I grew up. That is probably why I felt at home there. Not surprisingly, California is the one place in the US that does in fact have a Mediterranean climate similar to Italy and Greece. 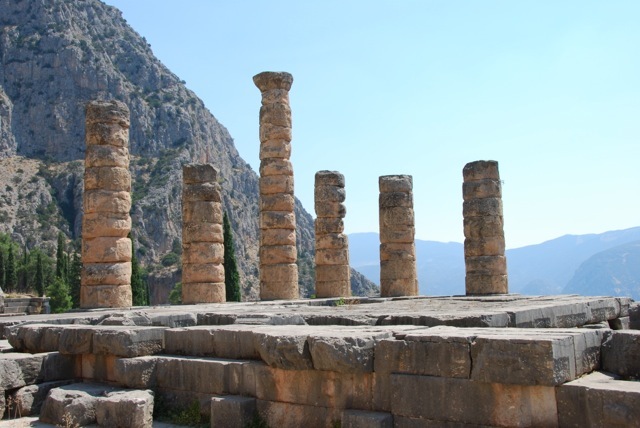 Delphi was a special place to the ancient Greeks. It was here that they could consult the oracle, a Greek prophetess. She would answer questions and tell of the future in a very mysterious, riddle-like way. Many came to consult with the oracle at this sacred site. 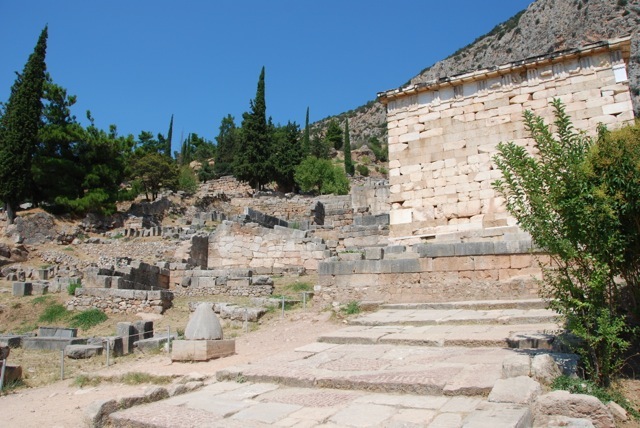 Once you arrive at Delphi, you have to be prepared for a lot of climbing. Be sure to wear good shoes and bring lots of water and sunscreen! As you walk up the road, these are the first ruins you encounter. 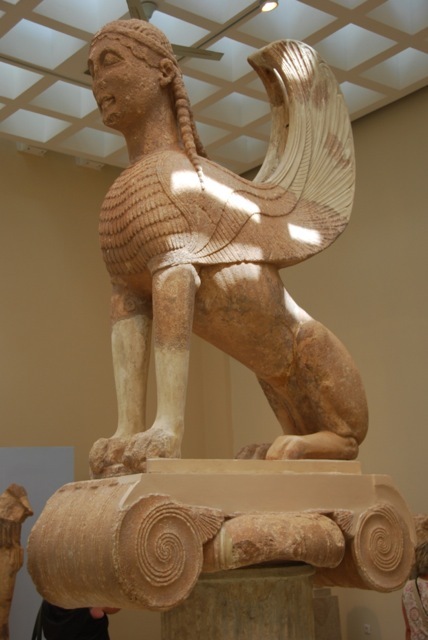 They are especially interesting because they contain both ancient Greek and early Christian symbols, suggesting that the area was adapted later. Once you pass this location you can then explore the ruins on the hillside. 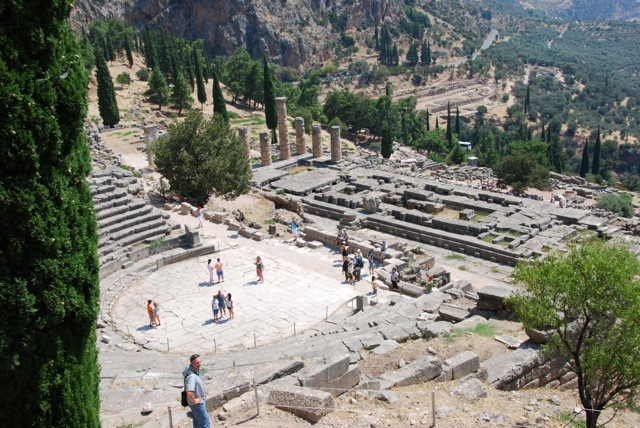 It is the sanctuary of Apollo which housed the Delphic Oracle. I was very interested to learn that the role of Oracle was flexible and rotated amongst several priestesses. Modern speculation and research shows that underneath the temple location was hot spot activity (like Yellowstone). Gasses would escape from the ground into the sacred oracle site, perhaps creating a drug-like vapor that would facilitate the oracle’s prophecy and meditative state. 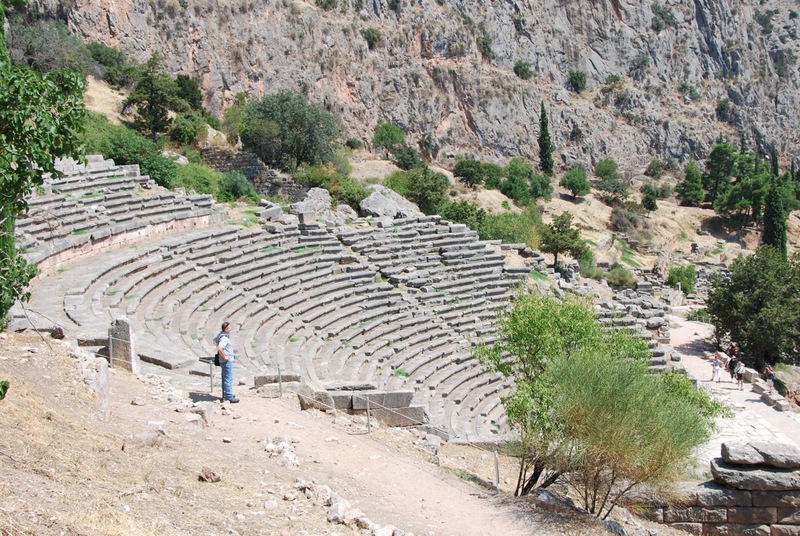 At Delphi there is also a marvelously preserved amphitheater. 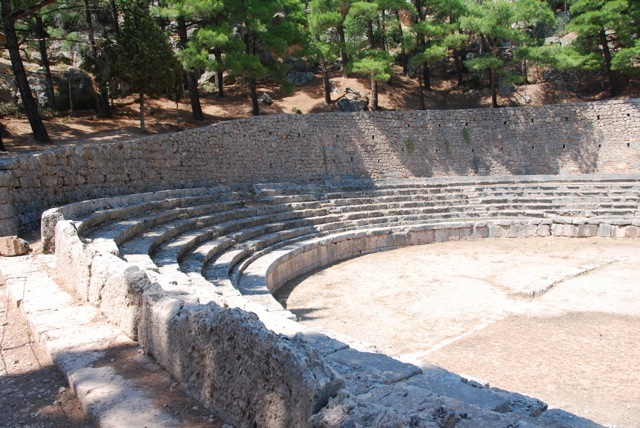 Here we were instructed by our colleagues about Greek theater. Here is a remarkable view showing the theater from farther up the hill. Up even farther behind the main hill are remnants of a stadium, perhaps the site of games and competitions. I was enjoying sitting in the shade and looking out at the amazing view. It was so sobering and fantastic to imagine the ancient people of Delphi looking out at the same (or at least a similar) view. 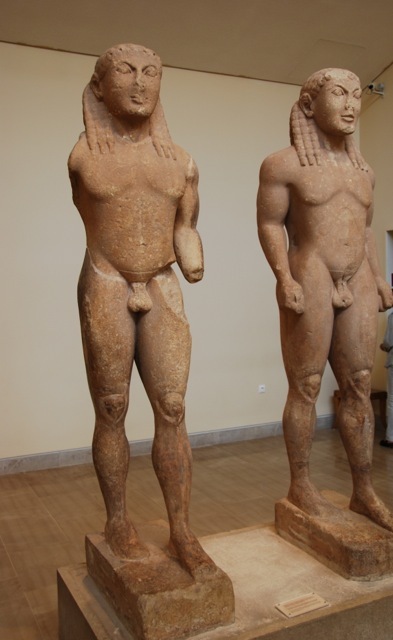 Also on the grounds in a remarkable museum with other relics and statuary from Delphi and other local sites. After our visit to the museum, we headed into town for lunch and browsing. The town was so charming. I couldn't get over how clean and tidy the whole town was. 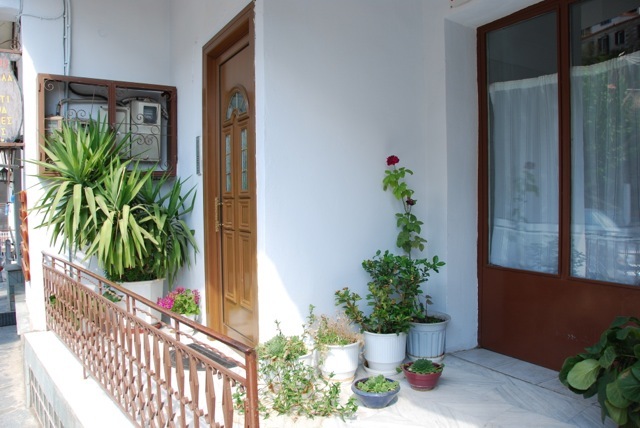 It looks like someone scrubs this porch every day. We strolled about, looked in shops, and had a leisurely lunch where we were afforded such pleasant service. Of all our pictures that day, this one has to be my favorite. We are Scrabble fans so we were tickled to happen upon a table with a Scrabble board. It looked like it had just recently been abandoned, most likely so the players could go inside for lunch. 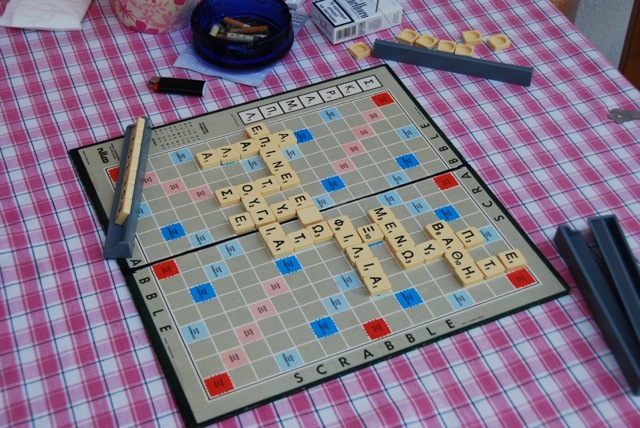 I want Greek Scrabble! 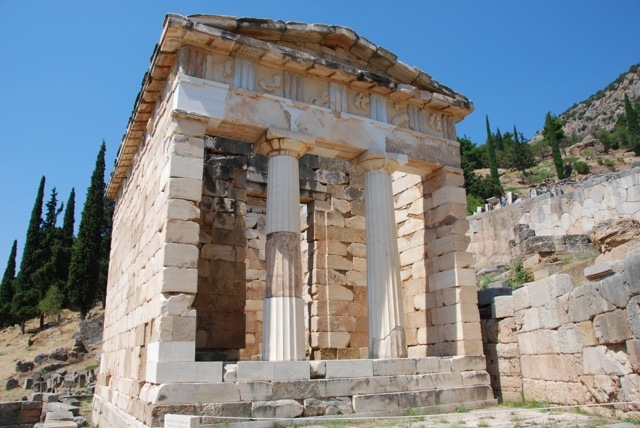 If you ever have are able to visit Athens, I strongly recommend a day trip out to Delphi. It does take the full day, but the countryside is beautiful and the ancient sites meditative and quiet after the hustle and bustle of Athens. It looks fabulous, but that is just too hot for me. Wow, was this in the same trip where you went to Italy or someone totally different? 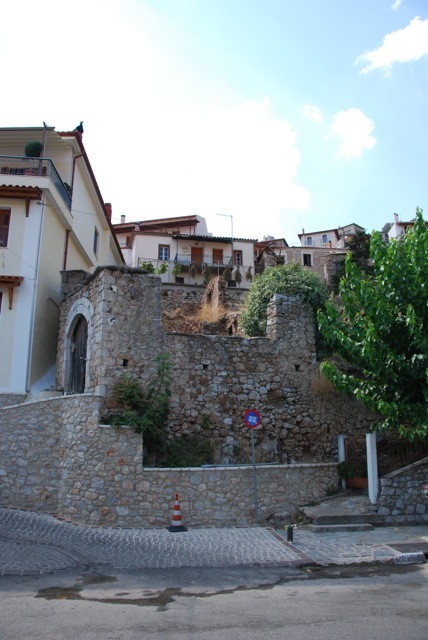 This was the year before Italy–a faculty trip to France, Greece, and Italy.